Straight away I'll tell you that the Tom Tom Go 500 is my favoutite GPS Satellite Navigation in the current ('05-'06) Tomtom range. 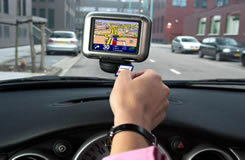 It has all the great Tomtom features and Bluetooth capability for pairing up with your mobile phone. Because it uses a SD card for memory, it's very fast, and as I don't navigate in Europe, its got everything I need (so far!) from a navigation device. But lets step back a little, and see what you get for your money. The Tomtom 500 comes with the unit itself, car-power lead, USB lead, windscreen mount, home charger bag, book & discs. As usual if you've got an UV reflective windscreen you'll have to buy an additional external GPS aerial. If you havn't used a Tomtom before, you'll be amazed how easy it is to use this device. After a quick setup, entering time, voice, home address, etc we can be ready to start. To use this (or any) Tomtom all you need is the mk. 1 finger. Tap on the middle of the screen, and you're into the main menu. Press "Navigate to" and we can choose how we want to find our destination. You can enter a full Post-Code, Address, Point of Interest (Hospital, Cash-point, etc), Town-Centre, POI in a city or just point at the map and say "take me there!". very comprehensive. The 500 has full street-level maps of the UK, and main roads in Europe. The maps are 2004, but every unit comes with a voucher for a free map upgrade when they roll out the new maps in the Summer of 2006, so no worries on that front. Like all GPS Satellite systems there will always be gaps in the map coverage, just like there are errors in paper based systems. But a Road Map won't get you back on track when you take a wrong turn! The Tom-tom 500 is fully customisable, you can change the voices, language, colours, etc. Press the options menu & you toggle the night colours on, or switch to the top-down view. It's even possible to download funny voices from tomtom.com, Austin Powers, Darth Vader, etc, but trust me, they get boring very quickly. Stick with Jane. In use the Tom Tom 500 works very well. The screen is clear and simple, the voice commands loud and come in plenty of time. Any wrong turns are delt with quickly, and it is simple to bring up a route list so you can avoid any potential snarl-ups. Not only a great GPS device, the 500 has Bluetooth, which means that it can pair up with your mobile phone for hands-free calling on the move. I've found the hands-free very good, and depending on your phone, you can download numbers from your phone, make text messages, and connect to the internet. Why would you want to connect to the internet? To avoid traffic jams! The Tomtom will contact tomtom.com & find out about queues on your route, and guide you round them. Great! I have a TomTom 500 purchased around 4 years ago, and I would like to up-grade the map. Can you tell me the best way. Tony. Go on over to tomtom.com and you can order new maps.